Recently released by Del Rey, Alive is an interesting and twisty little sci-fi horror. The first volume sets up the reader for the story to come, and its unanswered questions and odd occurences leave the reader wanting more. Around the world, people are mysteriously committing suicide by the thousands. However, in one Japanese high school, even more troubling things are occuring. A teenager named Kano finds out that he has somehow been infected by the "suicide virus," but hasn't died yet. When he and his friend Megu find their friend Hirose (a victim of bullying) on the roof of their school, with the bodies of his tormentors lying bleeding all around him, they begin to realize that there is more going on here than meets the eye. Later, Kano discovers a strange group of people, who have emerged since the uprising of the virus. They call each other "comrades," use supernatural powers to kill people...and Kano is one of them. 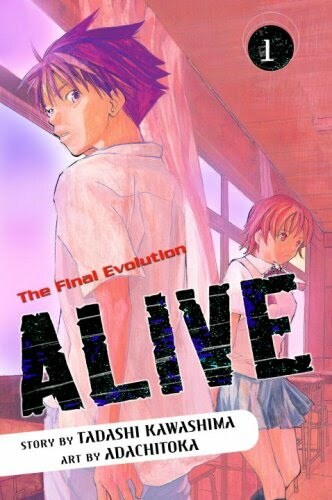 Alive follows the stories of Kano, Megu, and Hirose, among other minor characters, as they cope with the death all around them and seek to discover the truth about the deadly suicide virus. While Alive begins with a fascinating concept, a "suicide virus" that causes people to commit suicide willingly, it trails off a bit into territory that is better left untouched. A little bit of Serial Experiments Lain and a touch of Boogiepop make this series quite a read for the suspense and mystery fan. The primary fault with the writing, however, is its unnecessary use of humor in very serious situations. Characters like Kano's older sister (the high school nurse) will punctuate the otherwise very intense mood with pervert jokes, fanservice, and other forms of crude humor. Finally, the series seems to be trying to include action within the suspense and horror genre of the manga. (Using the "comrades" and their strange powers, along with Kano's ability to use the same powers) It is hard to tell where this might take us, but hopefully it will be blended into the more suspenseful mood held up through most of volume 1. The art in Alive utilizes an interesting style. Adachitoka prefers to go for expression rather than detail in his characters, leaving many things undetailed in order to achieve a more expressive, interesting visual style. His backgrounds and other non-human work, however, is detailed, and maintains a dark atmosphere. Toning is dark and helps the mood a lot, while there are many good uses of visual effects like the "shaken" effect in which the drawing is copied and then altered to give a shaken effect. Adachitoka has mixed successes when it comes to character designs. A select few characters, mostly the "comrades," look perfectly creepy, while Kano's sister and the big-lipped design she is given is sickeningly overdone. Overall, there's not much to complain about when it comes to art. Even when Adachitoka makes his characters less detailed, they still feel real and emotional enough for you to connect with them. Del Rey's extras in volume 1 are pleasing as always. In addition to some very nice notes from the writer and author, there are plentiful translation notes in the back of the book. Also in the back is a collection of short light comics, or 4koma, involving the characters of Alive. These are all comedy, and hence out-of-place in the dark world of Alive. Of course, it doesn't help that they're not particularly funny either. I first heard about Alive at AnimeNEXT, during a Del Rey press conference as they reviewed their upcoming releases. When it was first described, I pictured a truly dark and disturbing manga along the lines of such classics as Lain and Boogiepop. Instead, it is at once a dark, bloody story, and a light school life comedy. It's a dissapointing read, but Alive volume 1 will get you interested in a potentially great story that is standing on the edge of a building, waiting to fall off. Will it choose to throw itself off into the death that is mediocrity, or will it turn back and become something original?